Warm, gooey, chocolatey Hot Fudge. One of the best things ever. 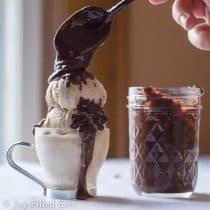 Now you can indulge in this easy 3 ingredient, sugar-free, low carb, keto hot fudge recipe. A few weeks ago we took the kids to Friendly’s for dessert as a special treat. I rarely cheat on my diet but I couldn’t resist helping my toddler with her hot fudge sundae. The hot fudge was so good I couldn’t stop. I can’t remember the last time I had real hot fudge. I know it has been years. A week or so later when I was making the ganache to fill my Chocolate Ganache Filled Raspberries and top my Raspberry Waffles I ended up with an excess. Is it ever a problem to have excess ganache? I think not. So I put it in a little mason jar and stuck it in the fridge. A few days later I came across some Vanilla Latte Ice Cream in my freezer. I really really thought I was out of ice cream. It was a very pleasant surprise. Even more pleasant when I heated up that chocolate ganache, added a bit more cream, and ended up with a perfect hot fudge sauce. 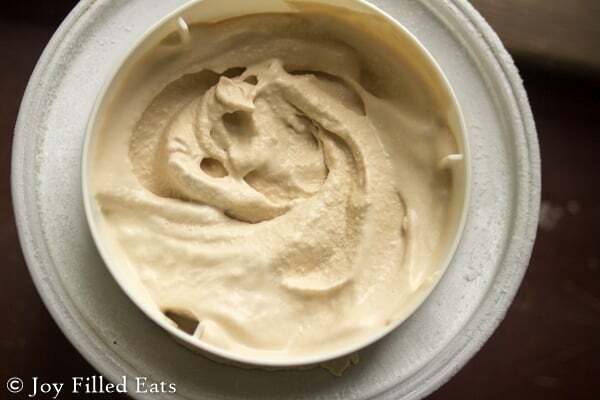 Vanilla Latte Ice Cream – SO good – it is the perfect light coffee ice cream with hints of vanilla in every bite. Over the next couple days, I tweaked this hot fudge recipe to get the perfect measurements. I’ve also tried heating and cooling the hot fudge in the jar a few times and it works well. Since this does use real cream I wouldn’t heat it in the jar more than a few times or keep it longer than a week or two. But I doubt it will last that long anyway. I know mine didn’t. The trick to this is blending it. You need to blend it in a blender, rocket blender, or food processor to make it smooth and shiny. I prefer my hot fudge on the thick side. If you want yours a little thinner just add warm cream 1 tbsp at a time until it is your desired consistency. Microwave: Melt the chocolate in a glass bowl, removing and stirring every 30 seconds. Stir in the sweetener. It will clump up and look thick. Warm the cream in a glass measuring cup. Stir the warm cream into the chocolate. Spoon over ice cream. Lick the spoon. Stovetop: Combine the chocolate and cream in a small saucepan. Stir continuously over low heat until the chocolate is melted. Stir in the sweetener. Spoon over ice cream. Lick the spoon. The trick to this is blending it. You need to blend it in a blender, rocket blender, or food processor to make it smooth and shiny. I prefer my hot fudge on the thick side. If you want yours a little thinner just add warm cream 1 tbsp at a time until it is your desired consistency. This stores really well. I've microwaved it in a glass jar, put it back in the fridge, microwaved again, put it back in the fridge, and again until it was gone. It worked extremely well. This should keep in the fridge until the sell by date on the cream you used. 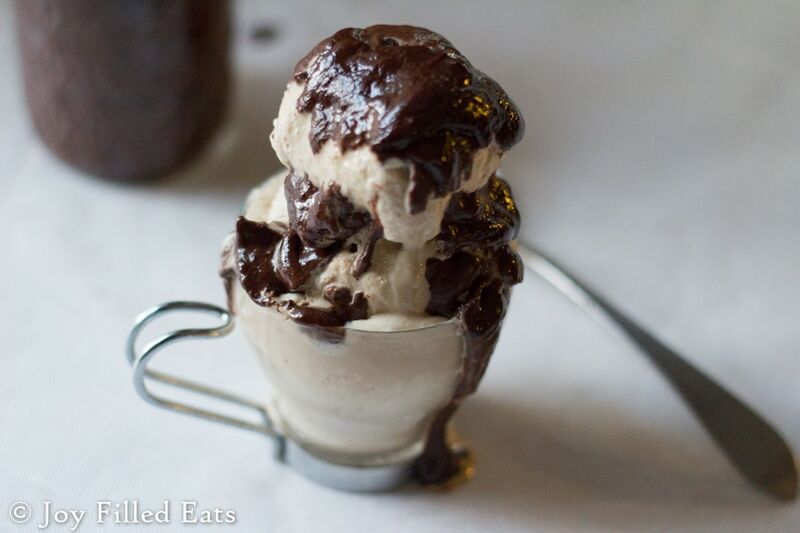 Need a dairy-free hot fudge? Here ya go! 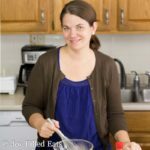 Jess from Simply Healthy Home has a great one! Only have cocoa powder? 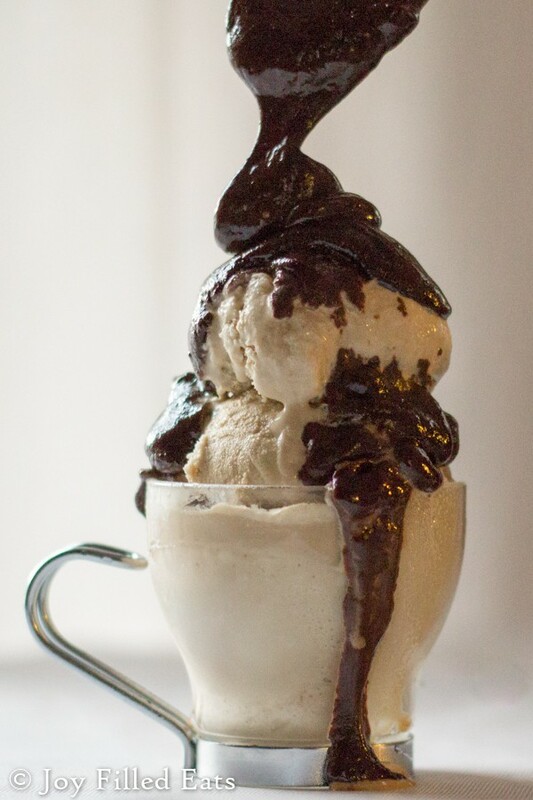 Check out this hot fudge from Nana’s Little Kitchen. Can vanilla extract be added to this recipe? It's summer and I'm always craving ice cream! can I just say I love you I love you I love you , love this recipe thanks so much!! I keep this in the fridge just so I can walk by the fridge with a spoon and grab some! Nothing better than a quick hit of hot fudge cold from the fridge! Can you use 85% dark chocolates (Aldi) instead of unsweetened? Can you tell me how many servings? Going to make this tonight for my sugar free butter pecan ice cream. Thanks for the recipe! This makes about 4 servings. So simple and so good! Hot the spot. Just made this jar full of deliciousness! Great flavor. Now I am waiting for my ice cream to soften so that I can eat it. That ice cream better hurry up or I might just eat the sauce with a spoon.